Forklifts are usually associated with moving cargo and stacking pallets, not myths and superstitions. However, there are a few myths about forklifts that have stood the test of time. From unique operating methods to armed robbery , powered industrial trucks certainly have their share of legendary tales and interesting historical record. Forklifts are in the news more often than you might think! You don’t need special training in order to drive a forklift. The U.S. Occupational Safety & Health Administration (OSHA) requires all forklift operators in the U.S. to have proof of training and instruction before using any powered industrial truck. If you don’t have the required training, you cannot legally operate a forklift, pallet jack, man lift, or other powered industrial truck. OSHA standard 29 CFR 1910.178 (l) (1) outlines the training requirements necessary to drive forklifts, and there’s no myth or misunderstandings around training: this is absolutely necessary to operate any type of powered industrial truck – no ifs, ands or buts about it! Forget about myths and get certified. We have training packages to help you become OSHA compliant, for much less money than you think (more about a related myth soon). Okay, let’s get back to some forklift myths. Forklifts are customizable, just like cars. This is a common myth about forklifts. Many drivers like to customize their lifts with lights, mirrors, cabin covers, and a near-endless assortment of personalized accessories. Powered industrial trucks are customizable, but only up to a point. If any components interfere with the safe operation of lifts (or any type of industrial equipment), they pose a danger to the driver and everyone around the forklift. When it comes to customizing, leave that for your automobile on the road, not your forklift in the warehouse. Thieves would never use a forklift to rob a bank or steal money. Any right-thinking person would immediately dismiss the idea of using a forklift to commit a crime. After all, these powered industrial trucks are kind of slow. They’d attract attention outside of the workplace. Basically, they don’t make a great getaway vehicle. But somebody forgot to tell thieves in Houston. In May of 2018, would-be robbers successfully removed an ATM machine from a Bank of America office, but failed to escape police. Don’t ever tell a determined thief that forklifts are off limits for trying to steal ATM machines! The first forklifts are the same machines as today’s powered industrial trucks. 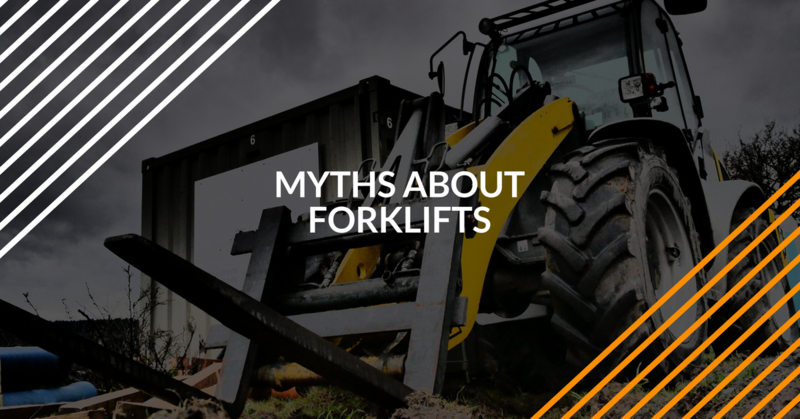 For some reason, this myth continues to persist; people think that the forklift hasn’t really changed much since the first forklifts were developed in the 1910s. But that’s not true; the forklifts of today are much different than the lifts from the early 20th century. For one thing, present-day forklifts are much smaller, yet more powerful. The lifts of yesteryear were bulky machines patterned after something called the “tractractor,” which didn’t even have raising forks! Forklift training is difficult, expensive, and frustrating. We have proven this myth wrong for years. Our easy, affordable, and accessible training modules allow anyone to achieve OSHA compliance. If you want to drive a forklift in the United States, you need training (we already covered this myth above). While some people think forklift training will take forever or cost an arm and a leg, nothing could be further from the truth. We Take the Myths and Misconceptions Out of OSHA Forklift Training! ForkliftCertification.com is the one forklift training source that combines exceptional value, unbeatable convenience, and the lifetime support you need to get everyone in your company OSHA certified! If you’re looking to refresh your safety knowledge or become certified for the first time, we have the training courses to help get you headed in the right direction. Thanks for stopping by, and check back for more helpful articles on forklift safety, industry news, and other useful information. If you have any questions about our training packages, please call our OSHA forklift training experts today at (888) 278-8896.